Small to medium and even very large paint/coatings manufacturers are all faced with the same issue of limited resources to support a wide range of critical business activities. And, cost-effective management of those needed resources is critical to a paint/coatings company's ability to profitably support their existing customer base, while also supporting sales growth. In particular, a key resource are the coatings formulators who have many diverse demands on their time. While they are required to develop and test new products to market/customer performance specifications, they are also required to perform a range of other technical-related activities in support of ongoing production. These include the time-consuming task of formulating a coating into needed colors, using various manufacturing options depending on amount ordered--all while maintaining coating performance integrity. An innovative and easy-to-use software has been developed by Concerto Tech that allows quick calculation of not only new product formulations for specification performance testing, but also of formulas in a range of colors using a combination of manufacturing methods and starting ingredients. This flexibility provides a means to provide more on-time customer supply; and, to do it in a way that also minimizes stock levels and lowers business operating costs--all while ensuring compliance to required product performance specifications. The complex and very time-consuming calculations to yield balanced formulas, with required stoichiometry for cross-linked products, are completed in seconds. A real life business challenge lead to the development of this software. Taiwan-based Chaoh Shinn Enterprise Co. Ltd (www.chep.com.tw) is a leader in the very competitive coatings marketplace of Taiwan and was faced with the challenge of supporting its existing business at needed profit levels, while also trying to grow. Tight profit margins in the very price-sensitive marketplace of Taiwan put very strict cost constraints on the coatings business's overall operating costs. Faced with these challenges, Timothy Huang, General Manager of Chaoh Sinn Enterprise Co Ltd, who has over thirty years of experience in the paint/coatings industry and is a chemical engineer, developed this software to significantly improve the productivity of his formulation staff by quickly performing any needed complex and time-consuming calculations. While the specially-developed software allows not only formulation of new products to customer and market performance requirements, it also provides the quick capability to develop formulas for those tested products in a range of colors to support sales. And, according to the desired production method and available combination of starting ingredients, using this specially-developed software, complex calculations can be quickly performed to allow production by tint base and universal colorants, or from basic raw materials, or using intermediates and other combinations. 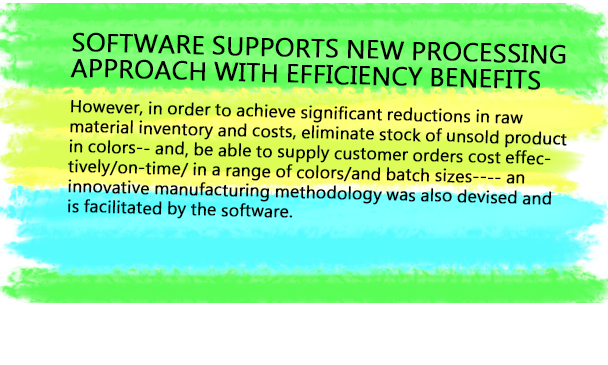 However, in order to achieve significant reductions in raw material inventory and costs, eliminate stock of unsold product in colors-- and, be able to supply customer orders cost effectively/on-time/ in a range of colors/and batch sizes-- an innovative manufacturing methodology was also devised and is facilitated by the software. Now, colors could be made by balancing tint base, with a fully formulated clear balanced coating (or clear resin-side component for cross-linked products), with a clear intermediate and basic raw materials. Calculations are completed easily and quickly to yield the needed formula from any combination of starting ingredients. And, the performance-integrity of the produced coating using this technique is always ensured to meet customer performance requirements. How much space in your warehouse is being used to store excess stock and dead inventory? How much time do your formulating chemists spend doing complex calculations-- rather than working on projects that can grow the business? Have you had to turn away new clients because your company did not have the capacity to produce the product they needed/when they needed it? Have you had to absorb the cost of unused paint left in inventory? Have you had product issues resulting in claims and returns due to formula miscalculations? The unique Concertotech software and methodology can assist in resolving these type issues. Using this innovative processing approach and software, Chaoh Shinn Enterprise Co. achieved double-digit improvements in efficiency and cost savings. And, Chaoh Shinn continues to successfully service its existing customer base while it has supported significant growth—and all while maintaining high service levels, with no significant cost increases in inventory and operating costs. All operations are simply more efficient. On a 6000 square meters piece of land -- which is less than two acres and also contains an office building, twenty (20) large solvent storage tanks, various sizes of mixing and grinding equipment, storage space and a parking lot-- Chaoh Shinn is able to produce various generic type coatings, such as polyurethanes, epoxies, baking enamels and nitrocellulose, in a range of colors and batch sizes. Chao Shinn sells to the “color and performance critical” segments of automotive, product finishes applications such as bicycles, consumer electronics products, plastics, glass, metal, wood-- and other special purpose coatings, as well as makes solvents for thinners and cleaners. This kind of flexibility does not require a huge tract of land nor does it entail ever expanding storage space and ever increasing operating costs. Some basic data input is required by the formulating chemist. And, Concerto provides a tutorial and can also furnish other necessary support, if needed. This additional support can include assistance on how to develop a fully formulated clear paint and clear intermediate to maximize operational efficiencies and cost savings using the software. The system is very easy to use once the basic information has been programmed. You are then free to mix the tint bases, clears, colorants, raw materials, any other intermediates, and even colored paints to get the colors your customers want. The software will instantly calculate and amend the formula for the paints that have been designed. The formula will be of the desired color, and will meet the required ratio of fully-formulated-resin component to curing agent for 2-pack products, as the software will ensure that the chemical equivalents meet stoichiometric balance and it controls the quantity of all raw materials, always yielding a formula that meets the physical and performance properties of the customer's specifications. The Concertotech software is in fact so innovative that it has been patented in several key countries. These are all very “stock and space intensive” operating modes. In addition, stocking warehouses and paint stores use universal colorants and then mix with tint bases to produce colored paints “on-demand” only, so that stock and space are minimal—but, time consuming/complex calculations are necessary for this operational mode as well. Concerto's Expertise Software can relieve the calculation burden for all the above types of processing approaches. However, if you want to be able to increase sales significantly with the existing support infrastructure, thereby accommodating a wider range of customers, and the ability to move into new markets, all while minimizing overall operating costs related to stock and storage space –take advantage of Concerto’s consultation, tutorial and other support services. For more information on how Concerto Tech Expertise Software can provide the needed tools and know-how to achieve these goals at an affordable price, please contact Concerto directly for further details.